This cookbook will be accessible via electronic download, right after you pay for it. Enjoy it on your PC or print a copy and keep it in the kitchen! However you enjoy it, you’ll find that the Thai Soup Secret is loaded with forty top-notch recipes which are medicinal and restorative. Discover nourishing congee, soup and broth recipes, each one of which is free or gluten and dairy. These pure and natural recipes are really outstanding. Experimenting with cuisine from Thailand is so much fun. You’ll love the way that it makes you feel, as well as how good it tastes. 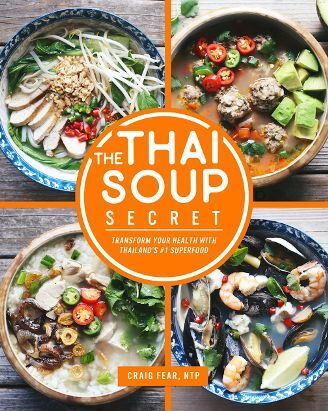 We believe that The Thai Soup Secret Cookbook provides exceptional recipes for a very low price, as well as plenty of important information about Thai herbs and their health benefits. Don’t settle for any less. Instead, treat yourself to the Thai Soup Secret cookbook today. It’s the key to boosting your health as you prepare meals which are nutritious and truly enjoyable.